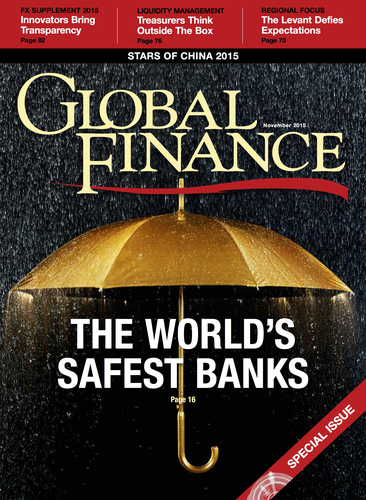 This year's country-by-country rankings name the safest banks in 105 countries. Seven sub-Saharan African countries are included in this year's list, compared with just five last year. CfC Stanbic is ranked as Kenya's safest bank, and Rawbank is ranked as the safest bank in the Democratic Republic of the Congo, after receiving a Caa1 rating from Moody's. In Central and Eastern Europe, Bank BelVEB takes the prize in Belarus after Moody's downgraded Belarusbank—last year's safest bank—in April. Komerční banka is the safest bank in the Czech Republic replacing Česká spořitelna, which was downgraded by Fitch in May as part of a wider downgrade of the Erste Bank Group, which holds 99% of Česká spořitelna's shares; and in Poland, Bank Pekao replaces PKO Bank Polski, which was downgraded two notches by Standard & Poor's in June. There are three new leaders in Western Europe. In Austria, Erste Group replaces Raiffeisen Bank International, which was downgraded by all three rating agencies during the first half of 2015. An upgrade from Moody's gives Cassa di Risparmio di Parma e Piacenza (otherwise known as Cariparma) the top position in Italy; and Svenska Handelsbanken replaces Nordea in Sweden, following Nordea's downgrade from Moody's. In Indonesia, Bank Internasional Indonesia replaces Bank Mandiri as the country's safest bank, and in Latin America, Scotiabank Perú replaces Banco de Crédito BCP in Peru. Global Finance's rankings of the safest bank in each country is based on long-term foreign-currency credit ratings assigned by the three international rating agencies: Fitch Ratings, Moody's and Standard & Poor's. National scale ratings whereby an agency ranks banks within one country against each other, but not with reference to banks outside that country, are not used. To be eligible for inclusion, a bank must be among the biggest 1,000 banks in the world, ranked by asset size. Effectively, this means that any bank with more than $650 million in assets is eligible. This eligibility criterion differs from that used for Global Finance’s safest global, emerging markets and commercial bank rankings, for which banks must be among the biggest 500 in the world. In the country rankings, banks do not need to hold at least two ratings to be included—a single rating from one of the three agencies is sufficient. For example, four of the seven African banks listed this year have only one rating. If there are several banks in a single country that hold the same ratings, the bank with the largest asset size is designated as the safest, in recognition of the strong positive correlation that exists between large asset size and high credit ratings. Many of the banks considered for inclusion in the country-by-country rankings hold ratings in sub-investmentgrade territory: lower than BBB-. This is often the result of a low rating assigned to a bank's home government. Although the three rating agencies have adopted a more flexible approach to the relationship between bank ratings and sovereign ratings, in practice it is rare for a bank to be awarded a rating higher than that of its own government. Global Finance’s scoring system begins with AAA, for which a score of 10 is awarded, down to BBB-, which receives one point. The next rating down, BB+, receives a score of -1, and so on. Although awarding negative scores may seem strange, it enables Global Finance to use a single system when ranking the strongest banks in the world and when ranking banks in countries where credit ratings are very low. Our country-by-country ranking provides insight on a far larger range of countries, but there are countries that have no eligible rated banks. We have no banks listed for Laos or for Honduras, but the biggest gaps lie in sub-Saharan Africa and the Middle East. Much of sub-Saharan Africa remains unmapped by the rating agencies. In the Middle East, banks in Algeria, Iraq and Iran—all major economies—remain unrated.